If you are a big fan of coffee, you will want to know these coffee hacks. Read on to know more. It's no secret that milk and cream are not the most healthy things to add to your coffee, but now you can have the same taste with less of the guilt. Adding a pad of unsalted, grass-fed butter instead of milk or cream can help you lose weight and boost your energy. The other guilty add-in common in most coffees is sugar. While artificial sugar substitutes are better, a good number of people aren't fond of them. Next time you feel the urge to add some sugar to your coffee, add a bit of cinnamon instead. It'll sweeten up your drink without adding any calories. Instead of paying big bucks for a milk steamer or a store-bought latte, you can make your own in a few minutes with just a milk frother, which costs less than $20. Pour some milk and sugar into your mug and then microwave it for a bit, then use your frother to make the mixture foamy. Then just pour in your coffee and enjoy. Cold-brewing your own coffee is both easy and cheap, and it offers a much different taste (less acidic) than hot-brewed coffee. To do it, soak ground coffee beans in water for 12 hours (overnight), and then strain out the grounds. Now you can either pour this coffee over ice and add cream and sweetener, or you can heat it up if you like it hot. Save money on creamer by making your own at home using just milk and flavored extract. Just mix a few drops of vanilla or almond extract into some milk, and you've got a perfectly good creamer for your coffee. Plus, it will last longer than store-bought creamers, so you don't have to worry about it going bad. Your body naturally produces the stress hormone cortisol to give you a burst of energy at around 7 am, noon, and 6 pm. Since you're already naturally energized at these times, you'll make the most of your coffee by drinking it between 9:30-11:30 am and 1:30-5 pm, when your cortisol level dips. Old coffee can still make a delicious treat; you'll just be eating it instead of drinking it. A true coffee addict will love cookies or brownies that use coffee instead of water in the recipe. You're probably used to adding extra ingredients to your coffee after it's already in your mug. Instead, you should add sweeteners or flavor enhancers to your beans before you grind them. Cinnamon, lemon zest, and chocolate are all good options you can add to your grinder so that your coffee will taste great without any add-ins after pouring. Ever notice how a lot of coffee can sometimes help you work faster, and other times it seems to not help at all? That's because coffee can only help you on repetitive tasks, not creative ones. If you are inputting data all morning, coffee will be a great aid, but if you need to come up with creative ad campaign, all it will do is keep you awake. We all know that the effects of caffeine tend to diminish the more often we drink it, but you can still get back that first-time-I-ever-drank-coffee buzz with the help of some grapefruit. The healthy fat in the fruit will help slow the absorption process of the caffeine in your body. While coffee has a mild diuretic effect to dehydrate you, the caffeine that it provides is more than enough support to get you to exercise. The increase of adrenaline allows you to push yourself harder than normal, and it also helps release fatty acids from your fat tissues. Some coffee 15-45 minutes before a workout is an excellent motivator, but try to bring some water along as well. 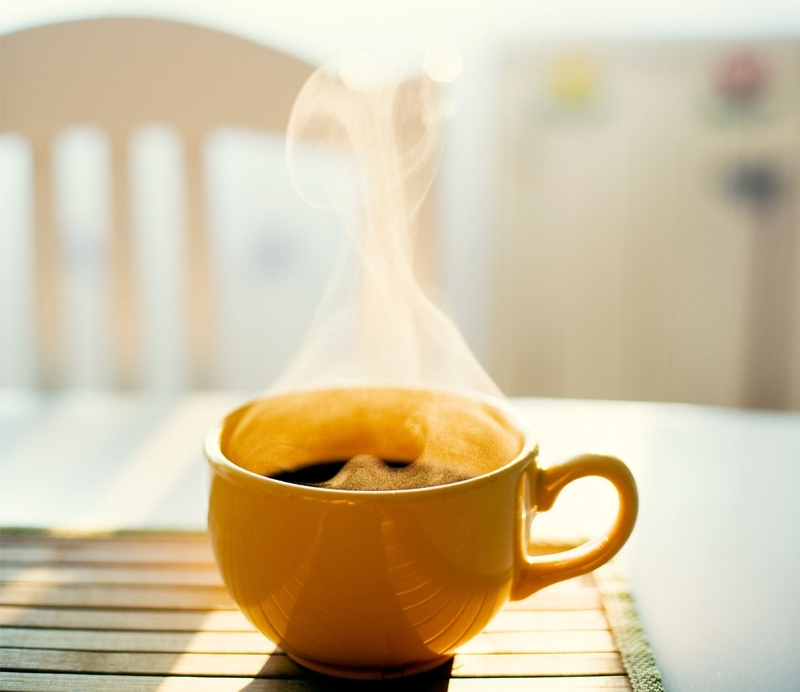 A lot of people like to start their day with a huge cup of coffee that they think will get them through the day. Actually, smaller and more frequent doses of caffeine are much more effective than one large dose. Whenever you're feeling tired, drink a small cup of coffee. Don't pour your old coffee down the drain; pour it into your ice cube tray! After freezing your coffee into ice cubes, you can use them in your iced coffees in the future so that they won't get watered down. Or you wan pour milk over your ice cubes for the taste of a nice iced latte. Store-bought coffees taste so great because of those delicious syrups they add in, but you can make them yourself and avoid those expensive trips to the coffee shop. All the syrups start with stirring 2 cups of sugar into 2 cups of water over low heat until it dissolves. Add in vanilla extract, caramel, or mashed raspberries, depending on the flavor of syrup you want, and stir until combined. For the raspberry syrup, you'll need to strain out the berry chunks. Like almost every passion, there are a number of apps that cater to coffee lovers. The Starbucks app helps you find the nearest stores, look up nutrition information, and even earn free drinks. CoffeeGuru will help you find independent coffee shops. Spro will help you make whatever coffee you want from your home with step-by-step instructions, and Art of Coffee will help you learn how to make those pretty foam patterns. Don't throw those old coffee grounds away; there are a ton of things you can use them for. Old grounds can help you garden as a great fertilizer and pest repellent. They can also help improve your home, as you can use the to absorb food odors, or you can make your own candles with the grounds at the bottom giving off that wonderful coffee smell. They can even help improve your body, as they make an excellent exfoliant and hair treatment as well. You probably already have a go-to order at Starbucks, but you could be missing out on a menu item that isn't exactly on the menu. The famous coffee chain trains their employees to make dozens of drinks that aren't featured on the menu, including a Nutella Frappuccino, a Spiced Apple Chai, and a Peach Ring Tea among other things. Don't suffer through bitter coffee, instead add a pinch of salt. The saltiness counteracts the bitterness and gives the coffee a smoother taste. Nobody likes drinking old coffee, but when you're sharing a pot with roommates or coworkers, it's not always obvious if the coffee is fresh or not. To avoid the guessing, put two foam cups on top of each other by the pot. Mark the bottom cup with increments of time, and the top with an arrow pointing down, then be sure to move the arrow to the time the pot was made when you make coffee. Server responsed at: 04/23/2019 6:10 a.m.